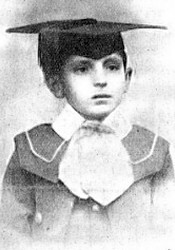 The "Boy Cantor" Master Moses Mirsky, eldest son of Hebrew Minister the Rev. Simon Mirsky (orig. 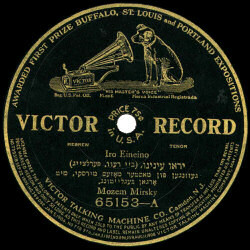 Mirski, b. Pinsk c.1868; d. Glasgow 1945) & his wife Rosa (nee Steinberg), was described as a "Wunderkind" (child prodigy). He was born in Bialystok (West Russia, now Poland), a major centre of Polish Jewry at the time. Moses followed his father to London in late 1904 and conducted services in the East End from January 1905, being trained initially as a Reader. He was complimented by fellow cantors in London for "his wonderful talent in singing. His tone and musical voice are perfectly marvellous". Later that year he gave concerts and officiated at services throughout Britain, including visits to Birmingham, Manchester, Liverpool, Leeds, Hull, Newcastle, Glasgow & Edinburgh. He also sang before Professors Lamany, Georges Philips & Lazarus at the Royal College of Music in London, from whom he received the highest praise for his alto voice of great power and range. In the summer of 1906 he gave concerts in many German cities, starting at Frankfurt-am-Main, having already been awarded the gold medal of the Musical Society of Amsterdam. ("This unusually gifted boy possesses an extraordinarily beautiful, bright, bell-pure voice and his singing technique borders on the miraculous. Especially delightful were Hebrew melodies, which he performed with an indescribably deep Jewish and musical feeling." - transl. from "Ost und West", Berlin, Aug. 1906.) In May 1908 he gave a recital at the Bechstein (now Wigmore) Hall in the West End of London. In July 1905 The Birmingham Evening Despatch described his singing thus: "A rich alto voice pianissimo, rising in swift crescendos until it flooded the hall with sound, sinking again to piano, garnished with florid little turns and sad cadences, the boy sang as if the words, as well as the music, were his own. Propitiatory, defiant; tearful, exultant; placid, agitated; his singing passed from emotion to emotion, rose and fell, while always the singer appeared sublimely unconscious of the surrounding worshippers." When allegedly nine years old, but probably in late 1905 (the matrix nos. indicate mid-November), when actually eleven, he recorded six single-sided discs of sacred Hebrew music with organ accompaniment, which were produced by Zonophone for the east London firm of Abraham Lyon & Co., 156 Whitechapel Road, a fancy goods importer & talking machine factor. Mirsky won a scholarship to the Guildhall School of Music in London in 1919 as a baritone and later became a Professor of Singing there. He died aged 51 on 21 Aug. 1945 in Stanmore, west London.